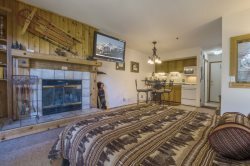 Studio suites are perfect for a single traveler or couple looking for Village convenience and a few more amenities. This studio is furnished with a queen Murphy bed and can accommodate extra guests on a sofa bed. A fully equipped kitchen is ideal for those looking to prepare their own meals. This rental overlooks Village Plaza and offers a great vantage to take in all the action. The Mountain Club’s best feature is, hands down, its proximity to five ski lifts, three restaurants, the ski repair center, and Kirkwood’s retail shops. With true ski-in, ski-out access, stopping in for a ski break is no sweat. When you’re done on the hill, feel free to stop by the recreation center, where you’ll find an array of fitness equipment, a sauna, Jacuzzi, and full locker rooms with showers. An adjacent ski locker room allows you to conveniently store your equipment and opens out to the base of chairs 10 and 11. Each rental is assigned a spot, either in the underground garage or lot adjacent to the Village Plaza. Each condo also comes equipped with complimentary wifi and cable tv. The Team was GREAT all around!!! Especially Nicole!! Instructions on using cable TV could be clearer. Difficult to access TV and then switch to playing DVD. MANAGER RESPONSE: We are in the process of updating all our TV/DVD instructions so guests are able to access them with more ease. You will check in at The Lodge as guests of the owner and leave no credit card or pay any fees to them. You will be given key cards for entering Mountain Club #218. If checking in after hours, an envelope with your name will be in the wooden late check-in box located in the front entrance of the Lodge. Parking is located underneath building in space #218.